You don’t need to be an expert to practice the secrets to great grilling. Whether you’re using an indoor or outdoor grill, cooking a succulent steak is quite simple. Select the right cut of meat. Generally speaking, the tenderest cuts will come from the loin sections, including sirloin, top sirloin, boneless strip loin and tenderloin. Trim the fat from the meat to about 1/8-inch and then allow the meat to stand at room temperature for 30 minutes for even cooking. While the meat comes to room temperature, prepare the grill for direct grilling over high heat. Be sure to leave an area with a burner off, or arrange the coals in a charcoal grill so the steak can be transferred to a lower heat if necessary. Coat steak lightly with oil and sprinkle with kosher salt and freshly ground black pepper. Place the steak on a hot grill rack and cook uncovered as directed below to desired doneness, turning the steaks only once halfway through cooking. 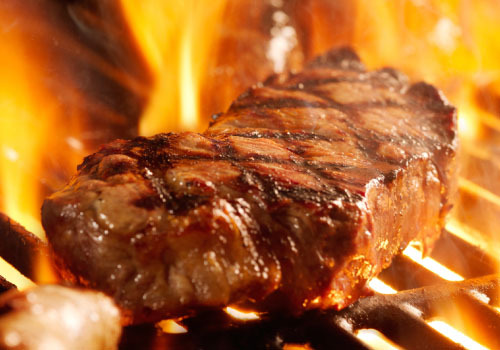 If flare-ups occur, move the steak to a cooler part of the grill temporarily. You may want to remove your steak from the grill when it reaches an internal temperature 5° to 10° below your final desired doneness depending on the size of the steak. Note: Cooking times are approximate due to grill variances. Once removed from the grill, let the steak stand five to ten minutes to allow juices to redistribute throughout the steak and internal temperature to rise. Keep in mind that cooking times will vary according to individual grills, so having an instant-read thermometer on hand is a must to check for desired doneness. This steak is very tender, responds well to sauces and comes from the tender end of the short loin. It’s low in fat and very popular. This marbled steak comes from the short loin and is a very flavorful, tender steak. This cut of meat is great for grilling and best when sliced thinly against the grain. This steak is lean, muscular and very flavorful. It grills quickly and is a great choice for fajitas. A flavorful and tender steak that comes from the rib area. The fat marbling makes it great for slow cooking, roasting and grilling.